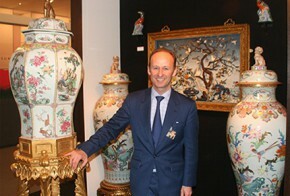 Alastair Gibson runs Gibson Antiques , former Director and Head of Sotheby’s Chinese & Japanese Ceramics and Works of Art Department for London and Europe. Alastair is a member of the Royal Institute of Chartered Surveyors, Fine Arts & Chattels Division. With over twenty years’ experience within the auction and fine art world, his specialist knowledge includes British, European and oriental ceramics and works of art. He has written articles for Sotheby’s Preview, Arts of Asia Magazine, the Antiques Collector’s Club and more recently the Listed Heritage magazine. Alastair regularly vets antique shows including Masterpiece, BADA and LAPADA antique fairs. His inaugural exhibition was at the June 2008 Olympia Fine Art & Antiques show, where he sold a rare `porcelain production’ soldier vase for a six-figure sum which is now on permanent display at the Peabody Essex museum, Salem, Massachusetts. In 2011 Gibson Antiques was selected to take part at the prestigious TEFAF Showcase, Maastricht, which allows new dealers the opportunity to exhibit at the internationally renowned art fair giving exposure to an international market. Since then Alastair has also continued to exhibit in Maastricht at Guus Röell Fine Art, in his elegant town house. From 2012 until 2016 Gibson Antiques took part in two fairs in Hong Kong, the International Antiques Fair and the Fine Art Asia fair, giving a broader global reach and buying opportunities to his Asian clients. These two shows in May and October have now become an integral part of his business activities.